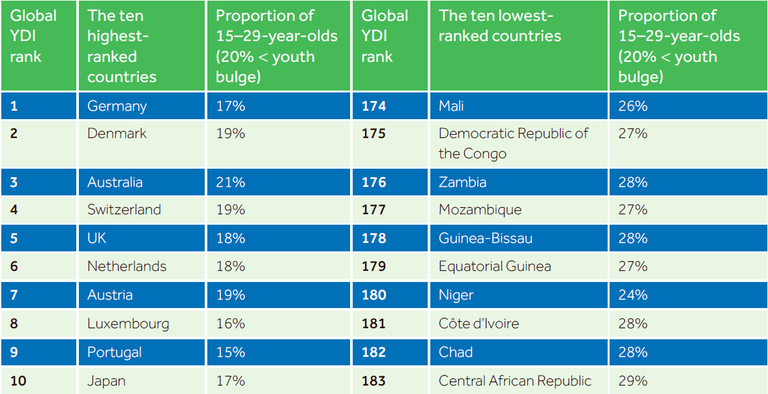 The rankings were listed in the Commonwealth's Global Youth Development Index and Report, which researched and analysed what life is like in the five key areas below for the world's 1.8bn people between the ages of 15-29. Young people are a greatly cherished Commonwealth asset, and 640 million of the citizens living in our 53 member states are aged between 15 and 29. It is because we have such riches, and have long recognised their potential for nation-building and for inclusive and sustainable economic and social progress, that as long ago as 1973 the Commonwealth Youth Programme was established as a pioneering intergovernmentalinitiative to champion the all-round development of young people. In the Global Youth Development Index (YDI), which is similarly innovative, the Commonwealth is again blazing a trail. It brings together vital data on young people for analysis and to guide policies and projects for youth development in every country. The YDI and their report track the story of youth development in great detail. By showing where progress is being made, and also where it isn’t, they identify areas that require attention and investment. The Commonwealth Charter and the 2030 Agenda for Sustainable Development provide internationally agreed frameworks and focus for our collective effort over the next 15 years. Success in measuring up to shared Commonwealth values and principles, and to achieving the Sustainable Development Goals (SDGs) will depend to a large extent on how we involve young people in shaping our world and our systems – locally, regionally and globally. The healthier and more skilled our youth are, and the more they play a recognised role in our societies, the more opportunities and freedom they will have to fulfil their aspirations and talents, and the more likely it becomes that we will succeed in achieving the SDGs by 2030.